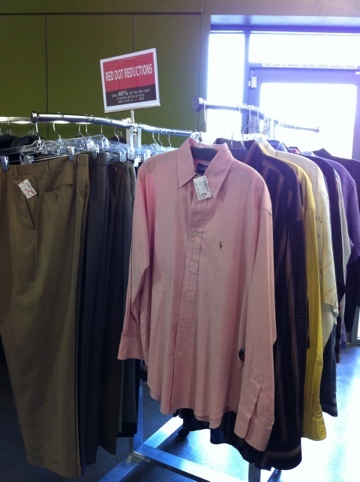 Polo shirts for $10 and nice looking suits. Wow, I was shocked when I browsed thru the men’s section at My Sister’s Closet. Typically the selection for men is meager at best when I’m out and about at the thrift stores. The back section of My Sister’s Closet is totally devoted to all things menswear. 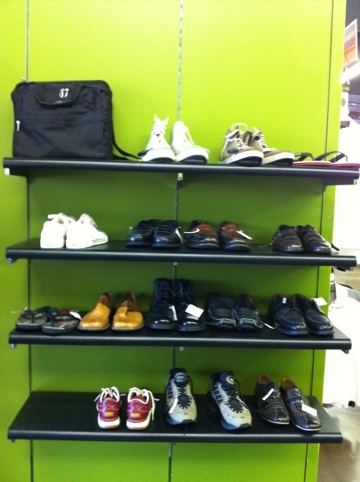 I found a wall of shoes– yes, a wall of shoes! And the shoes were barely worn at a fraction of the cost of a new pair. Check out these two suits. 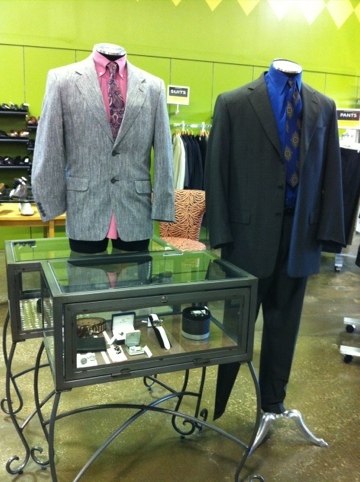 Both are great looks for the new grad interviewing or maybe someone who needs an economical style punch. I really like the blue shirt and the patterned tie pictured on the right, below. As far as accessories, I found a really good quality day bag and several beautiful watches. By far, the shoes were the biggest surprise “find.” Anyone into colorful and beautiful ties will be excited to check out the selection here. Maybe the man in your life is more casual and maybe looking for bargains? I found an entire rack of cool clothing at 40% off. Some of the shirts were under $9 and all were good quality and barely worn. The light pink dress shirt pictured below would look great with a nice pair of khaki pants, jeans for a night out or even black dress pants. Guys– thrift shopping isn’t just for the girls! This place rocks. 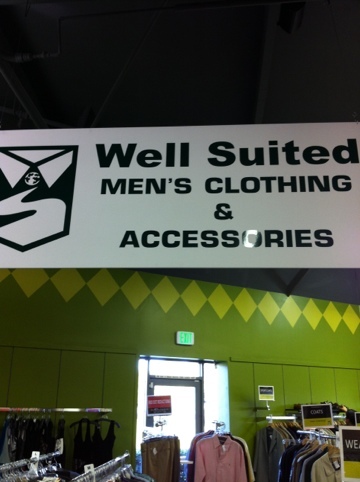 This entry was posted in Consignment Shops, La Jolla, Men's Department, Re-Use Stuff, Retail Therapy and tagged clothing, fashion, men's department, pink dress shirt, style, utc mall san diego, utc mall san diego ca. Bookmark the permalink. 4 Responses to Thrift Shopping for Men?! Oh for Pete’s sake, when I saw this blog title I thought you were going to show us a store where we could buy ourselves some deeply discounted men! Sure, we could all use an extra pair of hands around the house, to fix things, take out the garbage, unload the dishwasher, etc. But the cost of an additional husband is simply too prohibitive for any but the most wealthy of women. A thrift shop that features “gently used” guys at a lower price would be just the ticket! Let’s face it, women — statistically over half of us are going to end up with a “preowned” man at some point in our lives anyway. Think of how much more fun that man would be if he were a blue light special! Nearly as good but a fraction of the cost. Hahaha. I had to laugh when I read this. Maybe I should have used a different title for my post? I’ve gotten a variety of responses on this one from friends too. Oh well, it’s out there now and did catch attention which is the object of the game, right? Oh, I love this! I have such a difficult time finding thrift clothes for my husband. I’m in search of more men’s thrift! !